Whether you want to change interior suddenly. I introduce a method changed interior into with a Furoshiki easily! It is how to make tissue box cover today. 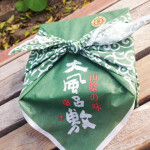 A necessary thing is only one piece of Furoshiki or your favorite cloth.